As the White House prepares to host Chinese President Xi Jinping for his first state visit to the United States later this month, the American public continues to see a number of issues related to China and its rising power as major concerns. In particular, economic issues loom large. China’s growth rate has slowed, its stock markets have recently plummeted and it is facing a variety of economic challenges, but Americans are still concerned about economic threats posed by China – especially the amount of U.S. debt held by Beijing, the U.S.-China trade deficit and the loss of American jobs to China. But it’s not just economic issues that trouble Americans. They are also worried about cyberattacks, Beijing’s human rights record, China’s impact on the environment and its growing military strength. On many of these issues, there is a sharp partisan divide, with Republicans expressing stronger concerns than either Democrats or independents. These are among the key findings of a new Pew Research Center survey, conducted among 1,003 respondents in the U.S. from April 13 to May 3, 2015. (For more on U.S. and global views of China, see “Global Publics Back U.S. on Fighting ISIS, but Are Critical of Post-9/11 Torture,” released June 23, 2015). Large majorities of Americans say all eight of the issues included on the survey are at least a somewhat serious problem for the U.S. And seven of these issues are considered a serious problem by roughly eight-in-ten or more of those polled. All three economic issues are rated as very serious problems by roughly half or more of the American public. Two-in-three say the large amount of U.S. debt held by China ($1.27 trillion) is a very serious problem, and six-in-ten hold this view about the loss of jobs to China. Concerns about job losses are especially common among older Americans, women, people with less education, those with lower incomes and Republicans. About half (52%) consider the trade deficit (which totaled $31.6 billion in July) a very serious problem. 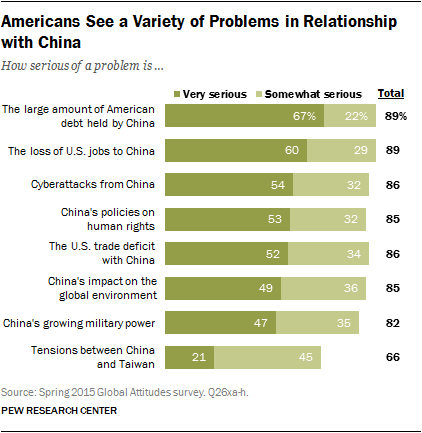 Even though economic issues continue to shape how Americans see China, there is slightly less concern about these perceived threats than there was three years ago, when Pew Research Center last asked these questions. Since 2012, the share of the public describing the debt issue (-11 percentage points), job losses (-11) and the trade deficit (-9) as very serious concerns has declined significantly. The current survey was conducted before revelations in June that U.S. federal workers had been targeted by cyberattacks that many experts believe originated in China. Even so, 54% considered cyberattacks from China a very serious problem. And roughly half say the same about Beijing’s human rights policies, the country’s environmental impact and its increasing military power, which was showcased last week in Beijing with a major military parade commemorating the end of World War II. Among the issues tested, tensions between Taiwan and China generate the least concern. Just 21% think this is a very serious problem. China has already become an issue in the 2016 Republican presidential contest, and as the new survey reveals, worries about China are especially prevalent among GOP supporters. For instance, 77% of Republicans say the large amount of U.S. debt held by China is a very serious problem, compared with 60% of Democrats. Republicans are significantly more concerned than Democrats about six of the eight issues on the survey. The exceptions are human rights, where there is no significant partisan difference, and China’s impact on the environment, which generates more worries among Democrats. Overall ratings for China are relatively unchanged since last year. Fifty-four percent of Americans have an unfavorable view of China, while just 38% hold a favorable opinion. In each Pew Research Center survey since 2013, roughly half or more of those surveyed have expressed a negative view of China. 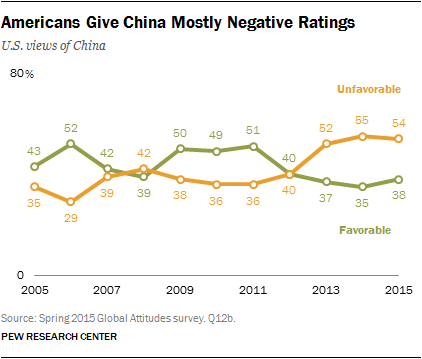 Prior to 2013, the most negative rating for China was 42% in 2008. As is generally the case for views about China on specific issues, there is a notable partisan gap on the overall favorability measure. 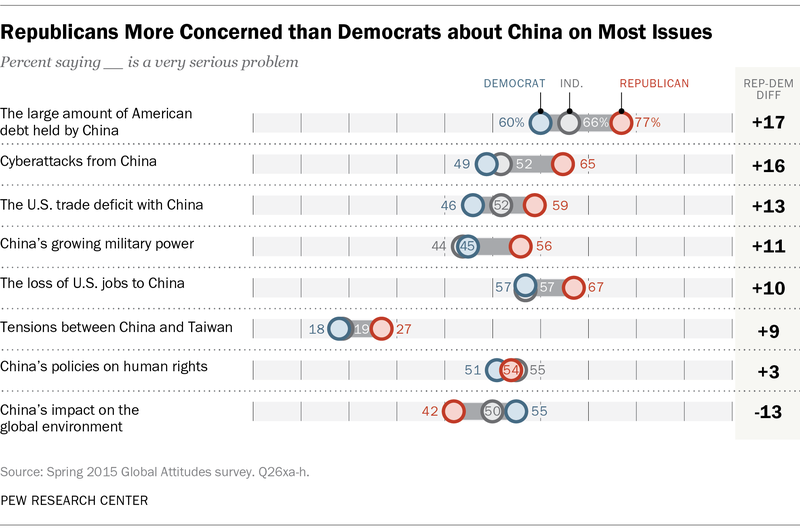 More than six-in-ten Republicans (63%) give China an unfavorable rating, compared with 51% of independents and 50% of Democrats. Negative assessments of China are also more common among older Americans. Fully 64% of those ages 50 and older have a negative opinion, while just 39% hold this view among people under age 30.